The whale shark (Rhincodon typus) is a slow-moving filter feeding shark and the largest known fish species. The whale shark holds many records for sheer size in the animal kingdom, most notably being by far the largest living nonmammalian vertebrate. The largest confirmed individual had a length of over 41 feet and a weight of more than 47,000 lb. Unconfirmed reports of considerably larger whale sharks exist. The whale shark is the sole member of the genus Rhincodon, and the family Rhincodontidae. The species originated about 60 million years ago. Whale sharks are found in tropical and warm oceans and live in the open sea, with a lifespan of about 70 years. Whale sharks have very large mouths, and as filter feeders they feed mainly on plankton. The name "whale shark" comes from the fish's size, being as large as some species of whales and also a filter feeder like baleen whales. Whale sharks primarily live in the open sea but not in the greater depths of the ocean. Seasonal feeding occurs at several coastal sites. Although typically seen offshore, they have been found closer to land entering lagoons or coral atolls, and near the mouths of estuaries and rivers. They are capable of diving to depths of at least 4,219 feet, and are migratory. Whale sharks have a mouth that can be 4.9 feet wide, containing 300 to 350 rows of tiny teeth and 10 filter pads used to filter feed. Whale sharks have five large pairs of gills. Their heads are wide and flat with two small eyes at the front. Whale sharks are grey with a white belly. Their skin is marked with pale yellow spots and stripes which are unique to each individual. The whale shark has three prominent ridges along its sides. Their skin can be up to 3.9 inches thick. The shark has a pair of dorsal fins and pectoral fins. Juveniles' tails have a larger upper fin than lower fin. The whale shark is one of only three known filter feeding shark species (along with the basking shark and the megamouth shark). They feed on macroalgae, plankton, krill, Christmas Island red crab larvae and small nektonic life, such as small squid or vertebrates. They also feed on small fish and the clouds of eggs and sperm during mass spawning of fish. The many rows of vestigial teeth play no role in feeding. Feeding occurs either by ram filtration, in which the animal opens its mouth and swims forward, pushing water and food into the mouth, or by active suction feeding, in which the animal opens and closes its mouth, sucking in volumes of water that are then expelled through the gills. In both cases, the filter pads serve to separate food from water. These unique, black sieve-like structures are presumed to be modified gill rakers. Food separation in whale sharks is by cross-flow filtration, in which the water travels nearly parallel to the filter pad surface, not perpendicularly through it, before passing to the outside. Denser food particles continue to the back of the throat. This is an extremely efficient filtration method that minimizes fouling of the filter pad surface. Whale sharks have been observed "coughing" to clear a build-up of particles from the filter pads. Whale sharks migrate to feed and possibly to breed. Despite its size, the whale shark does not pose significant danger to humans. Whale sharks are docile fish and sometimes allow swimmers to catch a ride, although this practice is discouraged by shark scientists and conservationists because of the disturbance to the sharks. Younger whale sharks are gentle and often play with divers. The whale shark is targeted by commercial fisheries in several areas where they seasonally aggregate. The population is unknown and the species is considered vulnerable by the IUCN. It is listed, along with six other species of sharks, under the CMS Memorandum of Understanding on the Conservation of Migratory Sharks. 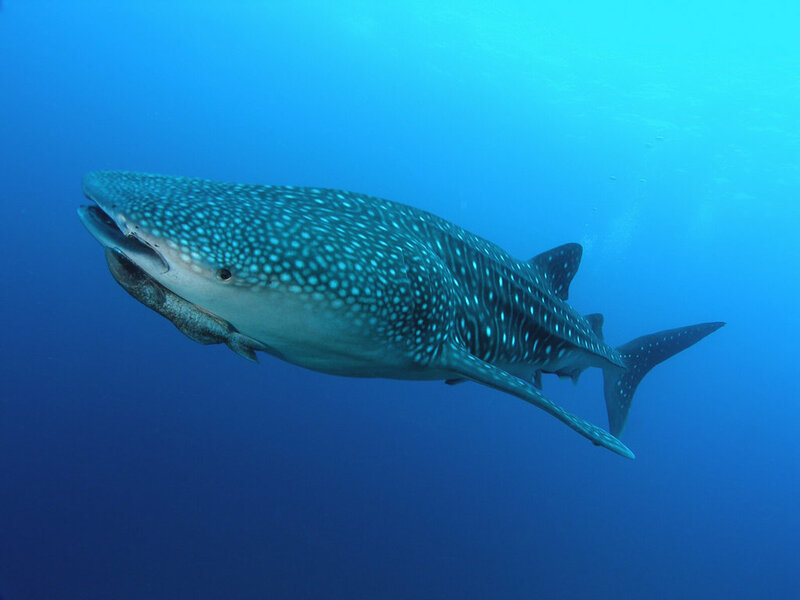 In 1998, the Philippines banned all fishing, selling, importing and exporting of whale sharks for commercial purposes, followed by India in May 2001, and Taiwan in May 2007. They are currently listed as a vulnerable species, but continue to be hunted in parts of Asia, such as Taiwan and the Philippines. In 2010, the Gulf of Mexico oil spill resulted in 4,900,000 barrels of oil flowing into an area south of the Mississippi River Delta, where one-third of all whale shark sightings in the northern part of the gulf have occurred in recent years. Sightings confirmed that the whale sharks were unable to avoid the oil slick, which was situated on the surface of the sea where the whale sharks feed for several hours at a time. No dead whale sharks were found. Whale sharks were also added to Appendix II of the Convention on International Trade in Endangered Species of Wild Fauna and Flora (CITES) in 2003 to regulate the international trade of live specimens and its parts. Whale sharks are also victims of captivity for human entertainment. Even under the best of circumstances, captivity is cruel for wild animals. Confined to tiny enclosures and gawked at by crowds, animals in exhibits endure constant stress. They may suffer from temperature extremes and irregular feeding. With little room for exercise, they become listless, their immune systems are weakened, and they become prone to sickness; many resort to self-mutilation in reaction to stress or boredom. Mental illness is rampant among confined animals. Torn from their families and deprived of all dignity, every part of their lives is controlled by their captors. While aquariums may appear to be educational and conservation-oriented, most are designed with the needs and desires of the visitors in mind, not the needs of the animals. Many animals in aquariums exhibit abnormal behavior as a result of being deprived of their natural environments and social structures. Stereotypical behavior of these confined animals includes head bobbing, repeatedly swimming in circles and sticking their heads out of the water over and over again (surface break). If the animals attempt to hide to reduce their stress, which isn't easy when the displays are designed to meet the needs of the visitors, the aquarium staff take measures to keep the animals visible. Shark-feeding shows reinforce the “threat” that sharks pose to humans, rather than the grave situation faced by shark species because of human activity. “Touching” displays allow kids and adults to grab and torment aquatic animals. While the industry that displays marine animals claims it works to educate the public and conserve the animals, they deplete species from their natural habitats and do little to educate humans on animal issues. A substantial decline in aquarium-targeted species is taking place. Many animals in aquariums don't even have signs that identify the species.